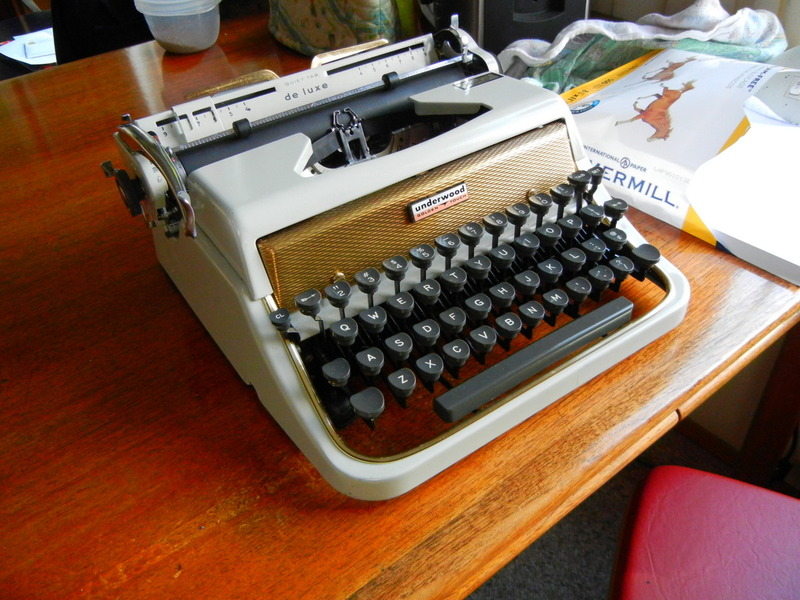 My first typewriter was a Hermes 9. I used it when I was starting out in business in 1983. Then came computers and the typewriter went into the closet, then bye bye. Fast forward to 2003. I bought a little portable for $10 at a thrift shop. 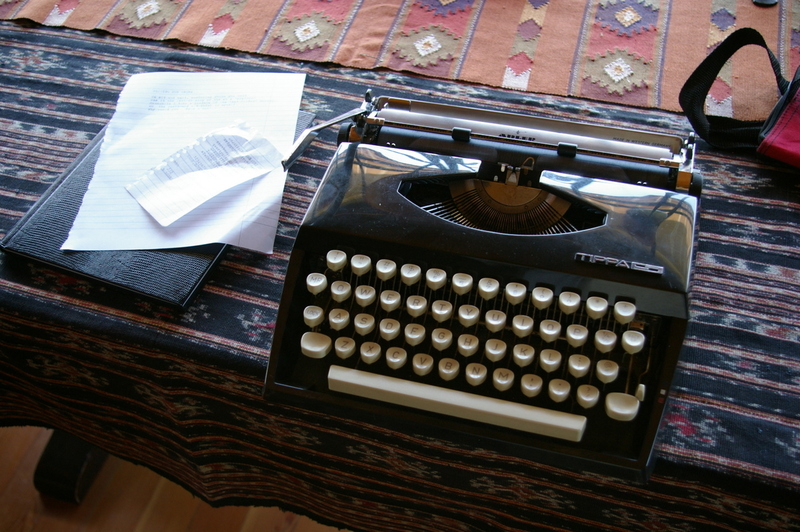 I typed a few things on it (including some thoughts about typewriters and where they were going) and got a back ache – so I gave it back. It was pale blue and had a red label on the top right. It may have been a Hermes too, but I can’t recall. Then last June I had an urge to type again, why I cannot imagine. I went to a thrift store and lo and behold here was a pair of Underwood’s. Yes a pair. UnderWOOD. I selected the fancier one, called Golden Touch which had gold trim. It was your basic Universal with all the trimmings c. 1956. We had some fun with it, typing poems and short pieces. However, it had one flaw – the platen advance mechanism did not work perfectly. Clearly some part was missing or installed wrong, but I could not make it work. I took it apart and put it back together – no dice. I was not planning on acquiring more typewriters until one day while on vacation in California I spotted a little package sitting on the floor in an antique mall. I picked it up and opened the case. It was an Adler Tippa S. I left without it, but it was on my mind for a day. The following day I decided to go back. 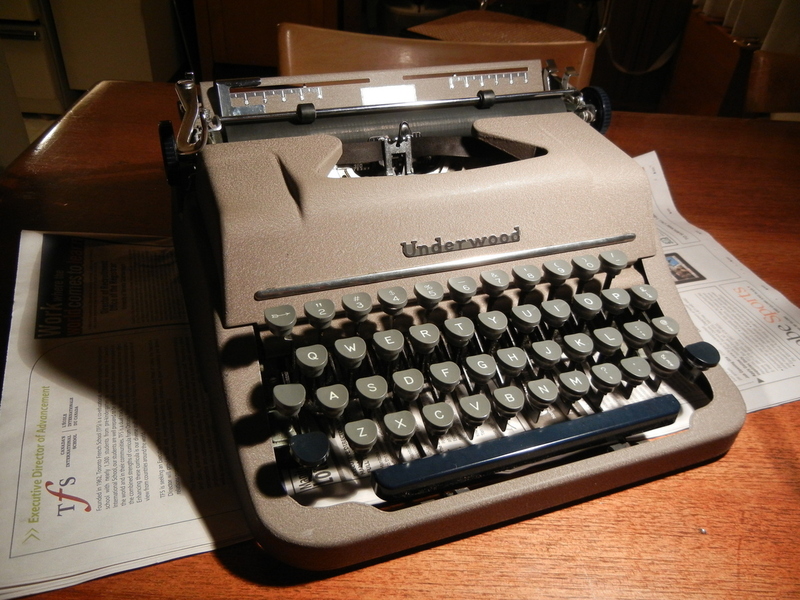 What the heck, it was small enough to carry around in the car, unlike the Underwood. So I bought it. It impressed me right off. So compact, so precise, and so easy to use. 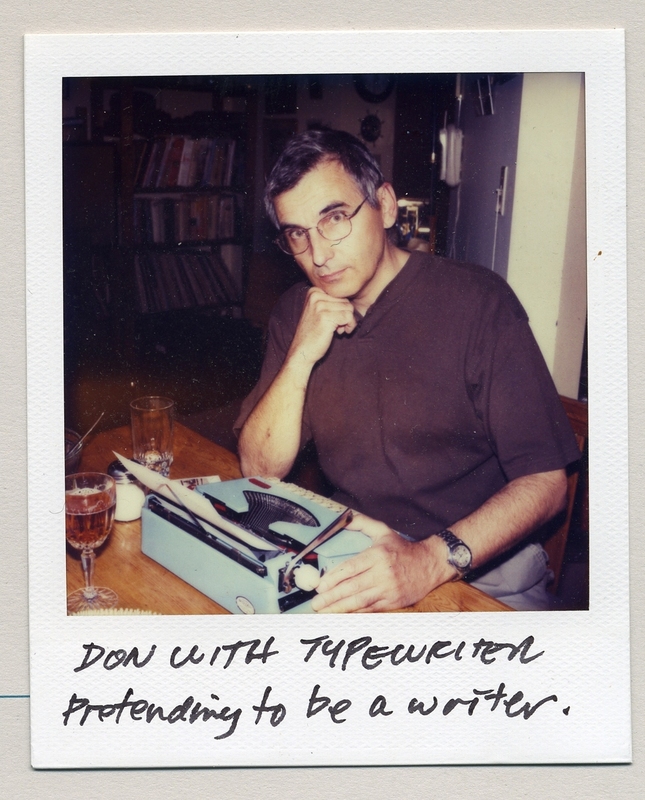 I began to look into the whole typewriter blogging world, and was amazed with all the fascinating things related to typewriters! I went back to the thrift stores with my eyes peeled for more. Now I have 11 typewriters. The latest is the other half of the pair of Underwoods from day one last summer. This one could be called the ugly sister, but basically it seems to have the same essential parts. It’s called the Correspondent c. 1952. The good news is that looking at the Correspondent gave me some ideas on how to fix the Golden Touch, so I went at it again and with the use of some heavy wire I got it to advance properly – now it works fine. And I didn’t break it. Very nice typewriters. I’ve had an Underwood Golden Touch on my wish list for quite some time. Nice turntable. Thorens? Don’t know – it’s not mine!